This black plate (carbonized nickel) design features extended heatsink wings. It has strong and focused output, and is highly recommended for enlivening any stock Fender or Marshall that uses a standard 6L6. High performance design delivers 30 watts, with very high performance/headroom. 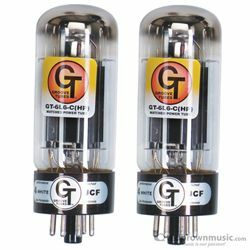 An outstanding replacement for any tube amp with 6L6 power tubes.